Citizens say hydropower battle is just getting started. In the Kopaonik National Park, where the River Samokovka flows into the River Jošanica, water is disappearing. Over the course of a 35 km stretch, 14 small hydroelectric power plants have cropped up, funneling much of the water away in pipes in order to generate electricity. 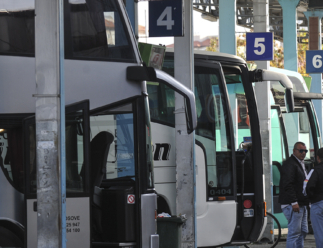 The problems faced by locals in this area are familiar across the entire Western Balkans. There are plans for the construction of 2,800 dams in the region, which will serve as the basis for around 1,000 mini hydroelectric power plants. Over 800 are planned in Serbia alone. Out of this overall number, 37 percent are set to be built in protected areas. Environmentalists say the construction of dams and mini hydroelectric power plants may have disastrous consequences on nature, flora and fauna, as well as on drinking water — and people. Activists in the Western Balkans say that their rivers are increasingly being channelled through pipes, with more than 800 hydropower plants planned in Serbia alone. Photo: Jovana Georgievski. Investors, who sometimes conduct preliminary terrain research and build without permits, stand accused of using all necessary means — from threats, to the use of force, and subtle political maneuvers — in order to implement their plans. The hydropower business is highly lucrative, largely because Serbia, as a signatory of the agreement to establish the Energy Community of the countries of South-Eastern Europe and the EU, is obliged to ensure it is using 27 percent of electricity from renewable sources by 2020; hydroelectricity is seen as the cheapest form of producing the required renewable energy. Data shows that electricity producers authorized to produce energy from renewable sources sell their electricity to the electrical power company, Elektroprivreda Srbije (EPS), for a state-guaranteed favorable price of 12.6 euro cents / kWh. In turn, this so-called green energy is ultimately sold by EPS to customers at a price almost 2.5 times higher than energy from non-renewable sources. However, at an average price of 6.5 euro cents / kWh, this price paid by citizens is still heavily subsidized. Efforts to halt the construction of new dams and plants, even after many years, have been ongoing with fierce intensity right across the region, from Valbona in Albania to Kruščica in Bosnia and Herzegovina, and Stara Planina, Priboj and Kopaonik in Serbia. Confronted with the possibility of remaining without a source of drinking water, citizens in Serbia and throughout the Balkans are attempting to resist. The thinking behind the large scale building of small hydroelectric power plants comes from the idea of obtaining as much power from renewable energy sources as possible. In this manner, it is hoped that electricity production should be as sustainable as possible for future generations. However, due to the way in which they are being planned and built, many of the hydroelectric power plant construction projects have turned into a systematic destruction of nature, which includes the draining of river beds and the disruption of groundwater, and extends to threatening the eradication of strictly protected animal species, as well as human settlements. The Ministry of Environmental Protection of Serbia (MEPS) admits that efforts to increase renewable energy supply have led to unintended consequences, particularly to the environment. “The production of energy from renewable sources is important, but such energy can not always be considered ‘green’ because the share of energy generated from these renewable sources in the total electricity production in Serbia is not in line with the harmful effects and changes that occur in protected areas,” the Ministry said in a written response to K2.0. In particular, the Ministry pointed out that protected areas in mountainous parts of Serbia are under threat due to the construction of a large number of small hydropower plants, despite the Law on Protection of Nature banning new construction in protected areas. Even though MEPS no longer supports the construction of hydroelectric power plants in protected areas — and has withdrawn its support for one development, a decision subsequently overturned by the courts — to date, there has been no move to take additional steps to ensure that damage on current construction sites is minimalized and that construction is being carried out in accordance with environmental protection measures. There has also been a complete absence of any planned action to investigate the long-term effects on the environment. Ratko Ristić, the dean of the Faculty of Forestry at the University of Belgrade and a member of Serbia’s Revisory Commision for Expert Control of the Technical Documentation for Projects of National Importance, told K2.0 that even the work of teams in charge of monitoring the process of constructing small electric power plants has been made impossible. “There are too many construction sites and only a few terrain vehicles and staff to do the monitoring, so proper monitoring of how these projects are implemented is currently impossible,” Ristić said. Moreover, according to Ristić, conducting a proper study on long-term environmental impacts, including the effects on forests and riverside wildlife, would take between 5 and 10 years. So far, no such study has even been initiated. Ulrich Eichelmann, chief executive of Riverwatch, which has been campaigning to protect global rivers since 2012, agrees that Serbia’s plans to go ahead with this construction of so many hydropower plants are being conducted without any strategy on how to prevent the devastation of wildlife. According to claims by concerned environmentalists, the dams are enabling the migration of fish and the heating up of water, meaning that sometimes the wildlife that depends on the river cannot survive. In a study published earlier this year, EuroNatur, an environmental protection organization based in Germany, mentions that there are 113 rare fish species living in Balkan rivers, and that 10 percent of them would face extinction if the currently planned projects were to be implemented. One of the first settlements where construction began is Priboj, on the River Lim, a border area between Serbia and Montenegro. Priboj is a city with some 30,000 inhabitants, settled in a basin through which the river flows for 12 km. In the last days of the warm and wet September in 2012, citizens noticed construction work on the bank of the River Lim that they had previously known nothing about. Local residents say that the workers they spoke to on the riverbank explained that “drilling for research work” was taking place. “Up until then, there had been no public discussion, nor did we know that something was to be built,” activist Saša Bjelić told K2.0; since 2012, he has been working on gathering documentation in order to find a way to halt the construction on the River Lim. The drilling was conducted by Geosfera, a company from the city of Čačak, by order of the Mini Hydro Investments firm, the co-owner of which, according to Serbia’s media, was Aleksandar Vučić’s best man at his wedding. Activists have been opposing construction on the River Lim since 2012, but say they have been hampered by irregularities in official processes. Photo: Saša Bjelić. 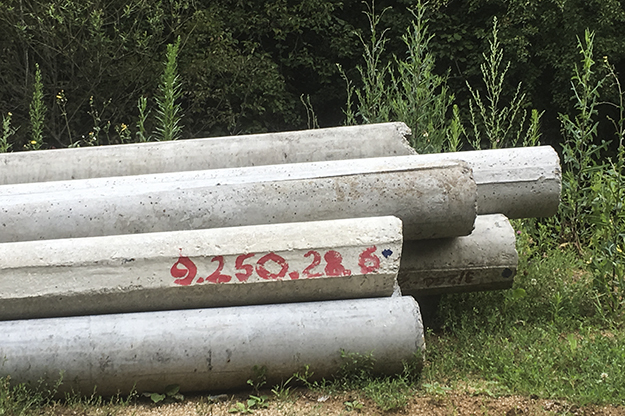 Despite the construction inspection resulting in a ban, the preliminary ground research at the site of a planned dam continued, with drilling for this potential hydropower plant — named Rekovići — taking place within some 20 meters of the Lim’s river bank. Organizing through the Facebook group VoLIM — Ne dam Lim (word play with the Serbian word for ‘love,’ voleti, and the river’s name), dissatisfied citizens at times halted the construction. But they say that this led to workers calling the police, who came to try to ID them. “In the end we came to an agreement with the police to disrupt the construction work of those who had no permits, so they would have to let us do it,” Bjelić said. In the meantime, however, in December 2012, all relevant construction permits for the Rekovići site were issued. Earlier, in March 2012, the Spatial Plan of the Priboj Municipality had been amended, to additionally include the construction of the small Rekovići hydroelectric power plant at the confluence of the Banjski stream and the River Lim, a few hundred meters away from the narrow city zone. At that point, an environmental impact assessment had been commissioned. This first study, conducted in 2012, had caused surprise and confusion among Priboj citizens, not least because toponyms appeared in the study that don’t exist in the city or the surrounding areas: a location called Crna Bara, which is part of the Municipality of Bogatić, the Lukavica River, which flows through the Municipality of Danilovgrad in Montenegro, as well as multiple streets that do not exist in Priboj. In light of the complaints, a follow-up assessment was ordered, which warned of the harmful effect on the environment of constructing a hydroelectric power plant, and additionally warned of a possible increase in the number of asthma patients, all due to possible humidity. In the course of opposing the construction, some activists say they have received direct and indirect threats, ranging from direct calls from investors, to warnings that came from “friendly advice,” and threats to sack activists’ family members employed in public institutions. In 2016, multiple criminal charges were submitted against Dragan Klisura, owner of the construction company Hidro Tan, for threats that he had allegedly made, but all were subsequently dropped by the Prosecution. While construction of the Rekovići plant slowly continues, other construction on the River Lim has now been halted, but only after efforts invested by activists, as well as interventions by the Government of Montenegro, a country where the construction of 41 small hydropower plants is planned. In 2014, the neighboring country’s government questioned the harmful cross-border impact of planned hydropower plants Brodarevo 1 and 2, which were both envisaged to have been located on the River Lim. Both of these hydropower plants were due to have been built by the Canadian company Reservoir Capital. The Montenegrin government took issue with not having been previously informed about the planned constructions, nor having participated in public discussions, while no environmental impact assessment had been delivered to them. That same year, the Administrative Court in Serbia annulled the energy permit for power plants Brodarevo 1 and 2, deciding in favor of a group of citizens NGOs and citizens from Priboj who had challenged the decision. The investor had the right to an appeal, but it chose not to. Instead, in January this year, Reservoir Capital confirmed it was pulling out of the project to construct the Brodarevo 1 and 2 hydropower plants, with an explanation that it didn’t want to get into long-term and risky projects. In Kopaonik, the struggle for the environment is also ongoing. Under the Kadijevac excursion area on the River Samokovka, the 15th hydropower plant to date in the National Park is currently being built. “With the construction of that hydropower plant, the River Samokovka canyon will cease to exist,” activist Jelena Drmanac told K2.0. Kopaonik has had national park status since 1981, due to it being home to a large number of endemic plant species, amongst which there are the Picea Omorika and Alpine Edelweiss. The Samokovka River, which is currently subjected to construction, has a status of a Natural Reserve as part of the Kopaonik National Park. A Machine Hall is located at the very entrance to the national park, where an ecological tax is paid when entering from the direction of Jošanička Banja in the Municipality of Raška. According to Insajder, as many as seven mini-hydropower plants have been built in the Municipality of Raška without having had an environmental impact assessment conducted. Additionally, the Institute for Nature Conservation of Serbia reportedly gave an explicitly negative opinion on construction of the Županj small hydropower plant, which was built regardless. In December 2013, a citizens’ board was established in Jošanička Banja comprising four interested citizens with the purpose of scrutinizing the development of power plants in the area. Under public pressure, the Institute for Nature Conservation of Serbia decided to go out in the field in order to assess the influence of planned developments on the environment. The Institute for Nature Conservation report was submitted to competent institutions in 2014. 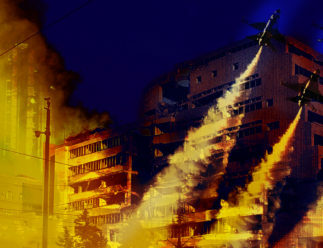 “The report called upon institutions to react, but this report was ignored,” Drmanac said. 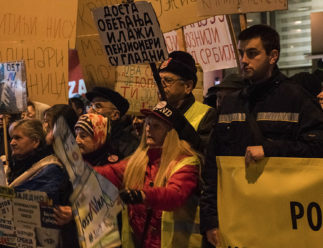 The citizens’ board was disbanded a few months after it had been established, reportedly at the insistence of the Jošanička Banja Community Council president. At the same time, some people in the local area got jobs at the hydropower plants, which also contributed toward softening local resistance. “A few working positions opened up — a daily allowance of around 30 euros is a lot in these times, and they got three meals a day, while the workers were allowed to resell construction material,” Drmanac explained, adding that some citizens sold their land to investors. There are plans to build 18 hydropower plants near Jošanička Banja, and a total of 53 in the territory of the wider Municipality of Raška. Drmanac says that her group is currently preparing documentation in order to try to halt any further construction. Similar struggles have been fought by local people in the village of Temska on the edge of the Stara Planina Nature Park in eastern Serbia, since as early as the 1990s, as they have sought to protect the pure waters in the region. In summer, the streams and rivers in the Stara Planina mountains only have a trickle of water, and these would be completely drained if small hydropower plants were to be built. Research by the Academic Speleological Alpine Club in 2011 revealed that the water streaming down the Stara Planina mountains is pure drinking water. A further analysis of the vulnerability of the waters in Stara Planina, carried out by independent researchers at the Faculty of Mining and Geology the following year, classified 47 percent of groundwater to be moderately vulnerable, and 28 percent to be highly vulnerable. The streams and rivers within the Stara Planina Nature Park contain pure drinking water, but studies have shown that they are under threat. Photo: Igor Đorđević. Back in 1983, construction of a dam began on the Visočica River. It was completed in 1990, forming the Zavojsko Lake — today the second largest artificial lake in Serbia. Since then, the Toplodolska River (known locally as Temštica), which the Visočica had previously flowed into, has remained at a minimum ecological flow, and the local otter population has abandoned the lower stretches of the river. The European otter, which lives in Stara Planina, belongs to the rare and protected species, and is listed on the red list of endangered species compiled by the International Union for Conservation of Nature (IUCN). “They wanted to take the river from us in 1990,” said Aleksandar Jovanović Ćuta from the village of Temska, one of the initiators of the Defending the Rivers of Stara Planina movement, which today has more than 40,000 members of its Facebook group. He explained that in that period developers had attempted to drill a tunnel through the mountain, redirecting the Toplodolska River into an accumulation above the village of Temska, in order to help feed hydropower plants. After years of being frustrated by local citizens, construction of the Toplodolska River tunnel was officially halted in 2007. However, plans by the Municipality of Pirot to build there returned in 2011, when the local spatial plan provided for 58 small hydropower plants in Pirot County, of which 43 are located in the primary protection zone, where construction is prohibited. A previously approved version of the plan had instead envisaged the construction of 58 small mills, which are part of this area’s tradition. Given the changes from mills to hydropower plants, the competency for issuing construction permits transferred from the local municipality to central government, with the municipality now saying it does not have the power to prevent building work. 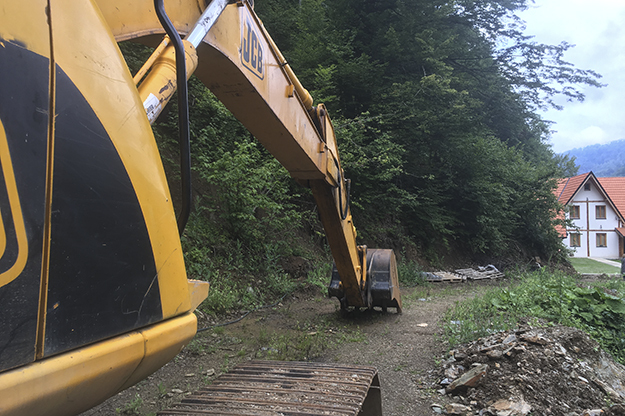 Construction vehicles have been a regular sight for citizens living around the Stara Planina Nature Park, as they attempt to prevent the loss of their rivers. Photo: Jovana Georgievski. Despite this, construction of new hydropower plants in the municipality has been held up by citizen actions and court battles. Citizens emphasize that with the building of the hydropower plants, the availability of drinking water and the survival of protected species — such as the river crab, the river trout, otter, lynx and brown bear — are brought into question. They particularly point to the fact that mass construction is planned on mountain rivers that have little water, hence the production of electricity could only be conducted without draining the riverbed during one part of the year, when snow melt runs off Stara Planina and Suva Planina. 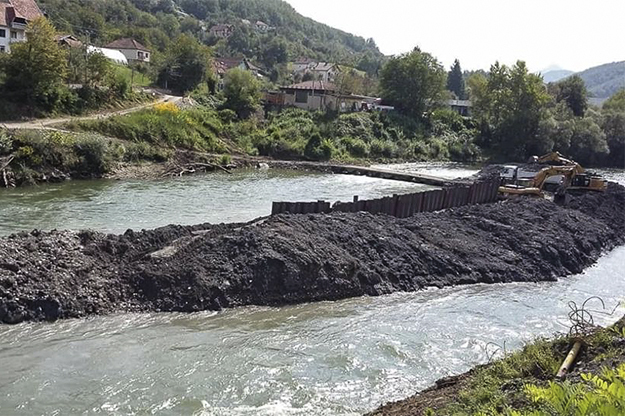 After a new construction site emerged on the Rudinjska River in Stara Planina last month, activists organized an action to ‘liberate’ the river by digging a bypass channel in order to bring the river back to its natural bed. Even though local police were on site and had advised the activists not to dig, the two parties peacefully negotiated before activists went ahead with their action. There were no arrests, and the Rudinjska River continues to flow. Defending the Rivers of Stara Planina has also gathered around 10,000 signatures for a petition to prevent hydropower construction. The petition was delivered to UNESCO in early August, and seeks to achieve the involvement of international organizations and institutions in this case. Citizens also held a large protest in Pirot on September 2 at which they declared that the struggle had only just begun. 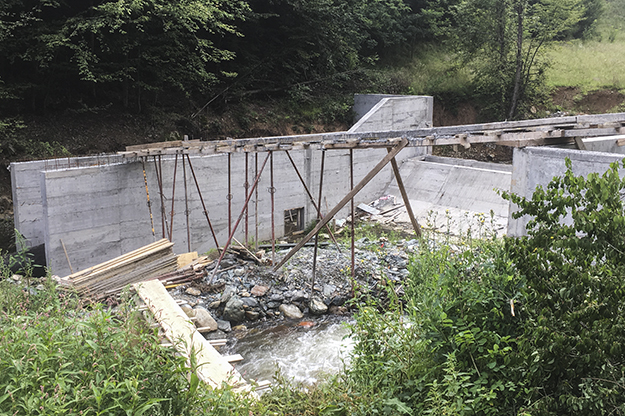 Despite opposition from citizens, environmental groups and the words of authorities, hydropower construction continues in the Stara Planina Nature Park. Photo: Jovana Georgievski. But despite the words, construction of hydropower plants continues in the Stara Planina Nature Park, on both the River Crnovrška and River Rakitska, with no institutions taking responsibility for stopping them. All things considered, the struggle for the rivers in Serbia, and the wider region, looks set to continue. Edited by Nidžara Ahmetašević and Jack Butcher. ABOUT THE AUTHOR Jovana Georgievski is a Belgrade-based journalist at Vreme Weekly. Her areas of interest are migration, and Balkan narratives and their reflection on culture and everyday life. 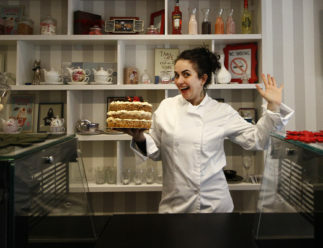 She is a Belgrade Open School alumna and speaks Russian and English.